President-elect Neal (left) introduced guest speaker Remi Adeleke, who met with Webster directors (center). Beth Vivaldi and Elizabeth Fiock (right) demonstrated Webster's online capabilities with the help of colleagues in Fort Bliss and St. Louis. Four Webster military and online education leaders represented Webster University at the 2018 Council of College and Military Educators (CCME) in San Diego March 25-30, with Western regional director Janice Neal being elected president of the body. CCME is an active proponent for the professional development of those serving in the military education community by providing a forum for exchange of information on educational programs, strategies and innovation among its members and associated partners. The association is composed of military educators and civilian educators with a mission to promote and provide educational programs and services and to facilitate communication between the membership and the Department of Defense educational support network. Fort Bliss and St. Louis. Sandra Kunz, southwest regional director, nominated Neal for the presidency with support from Michael Cottam, dean and associate vice president of Military Campuses and Online Education. 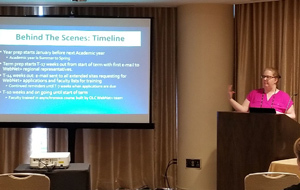 Neal and Kunz worked conference operations at CCME, while their Webster colleagues presented on Webster's WebNet+ offerings and demonstrated it for attendees. Fort Bliss director Beth Vivaldi, and Online Learning Center representative Elizabeth Fiock's presentation on WebNet+ inspired detailed questions on the established procedure. To demonstrate the capability, they also engaged colleagues via WebEx during the presentation, including Michael Biegler from Fort Bliss and Sarah Kuehnle from the Online Learning Center in St. Louis. This helped attendees visualize and understand how a Webster class using this teleconference technology connects students and faculty from across locations. Near the end of the week, Neal introduced a guest speaker, Remi Adeleke, a former Navy Seal and actor on the latest Transformers movie. Adeleke was born in Western Africa, but permanently relocated to Bronx, New York after the death of his father in 1987. After a career as a Navy SEAL, Adeleke decided to separate from the Navy in 2016, which led to his current career in speaking and acting.